Given the continuous discussions about renewable energies and despite the eroding subsidies, onshore and offshore wind power remains in the ascendancy. Furthermore, although the basic technology of extracting power from the wind has been known for centuries, the way power is needed today issues repeated new challenges to the designers simply because the wind is such an fluctuating source of energy. 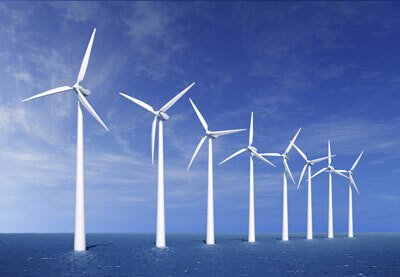 For one, the turbines are already supposed to start at low wind speeds despite their weights. Furthermore, they are intended to be characterised by a speed that is as constant as possible over a broad range of wind forces, in order to utilise the capacity of the generator in a uniform manner. And if the wind turns into a storm or hurricane, the rotation of the turbine blades has to be limited or, due to reasons of safety, even stopped. 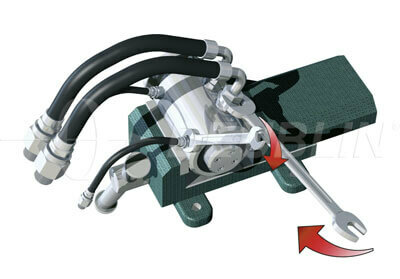 For contemporary wind turbines this limiting or stopping is implemented by using so-called “pitch adjustment”, i.e. the modification of the pitch angle of the corresponding rotor blade up to deceleration or stopping. In order to achieve the aforementioned, two central concepts oppose each other from a technical point of view: the hydraulic and the electrical pitch adjustment for rotation speed control and deceleration. As a lay person one could arrive at the conclusion that “electrical” would be the first choice, because electrical current is produced by the generator. However, the matter cannot be decided that easily as there are a couple of catches. In order to provide for the required torque for today’s systems in the case of electrical pitch adjustment, correspondingly large and therefore very heavy motors have to be used. Moreover, appropriately sized batteries have to be included in case of power failure so that the turbine is provided with the torque for its primary setting and is able to restart. However, similar to the situation at home it applies here: The moment you actually need the battery – it is empty! 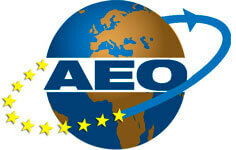 Furthermore, batteries are criticised on the basis of maintenance and environmental friendliness. In the field of hydraulics, batteries are compared to the pressure accumulator as approved component that contains sufficient reserve capacity to provide the torque required for restart in the case of power failure. A further positive aspect is that hydraulic mechanics operates in a damped mode therefore there is low wear of moving components. 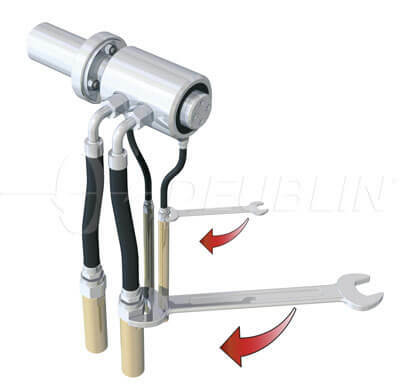 The most important part, or the centrepiece of the hydraulic unit, is the component making sure that the hydraulic liquid is pumped from the stationary pressure accumulator into the rotating hub and reaches the adjustment cylinder: a rotating union for high-pressure hydraulics! 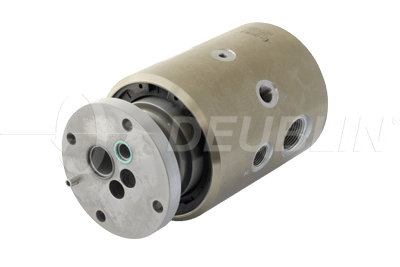 The requirements for this, in relation to the turbine, small component are extremely high: it is supposed to safely seal the static part from the rotating part and to guide the hydraulic medium in an equally safe manner with low maintenance requirements over many years up to decades. It is supposed to be installed easily in the case of on-site installation. It is supposed to be made of materials to resist the adverse environmental conditions both onshore and offshore and of reaching a long service life even in the case of a degree of contamination within the medium. 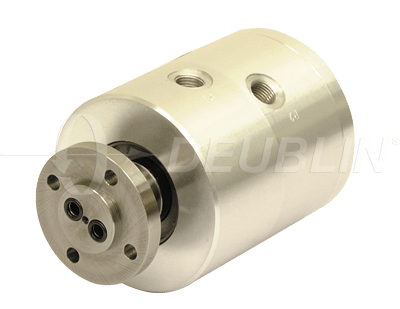 The high-pressure hydraulic models of the market leader in the field of rotating unions, DEUBLIN, meet these requirements and make sure that turbine manufacturers and operators can be satisfied over a long period of time without concern. The rotating unions used in this segment are based on a hydrostatic sealing principle with controlled bypass flow, in order to make sure that the sealing faces are lubricated on a permanent basis; a feature contributing to durability. They are available in single- to multi-channel designs and, depending on the model, up to 250 bar hydraulic pressure, as well as with central channel for sensor technology or connection to a slip ring. 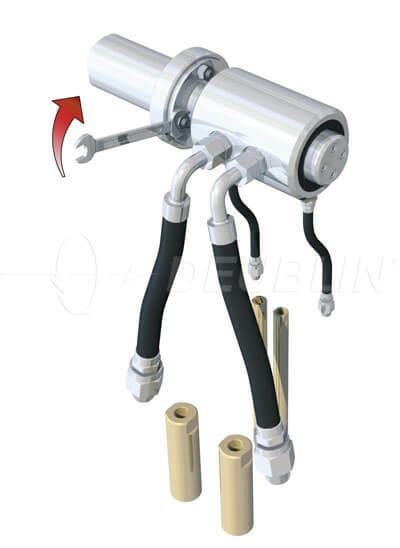 Furthermore, as today’s hydraulic systems equipped with a DEUBLIN Rotating Union are secured against oil leakage, there are no environmental implications. While it may well be adequate to adjust the rotor blades electrically in the case of smaller wind systems which consume power for the ramp up period anyway and do not only supply power to the grid. For larger wind mills the advantages of an autonomous hydraulic power block can be the decision making difference. And with the appropriate partner regarding the centrepiece (even for special solutions) there are no limits for both onshore and offshore from wind farms to large-scale turbines.